The best way to protect your family is not to use any fireworks at home — period. Attend public fireworks display and leave the lighting to the professionals. If you choose to use fireworks, East Pierce Fire and Rescue offers a few tips to keep you and your family safe as you celebrate Independence Day. Adult supervision around fireworks is important. Only adults should light fireworks and handle matches and lighters. Set family boundaries and talk with children about celebrating safely. Use care in selecting the area for discharge of fireworks, and the type of fireworks appropriate for that area. Weather conditions make grasses and vegetation dry and vulnerable to fire. Use legal fireworks, available at licensed outlets. Store fireworks out of children's reach. Only adults should light fireworks. Do not throw fireworks or hold in your hand. Light one firework at a time and move away quickly. Soak used fireworks in water. Be considerate - clean up used fireworks. Keep matches and lighter away from children. 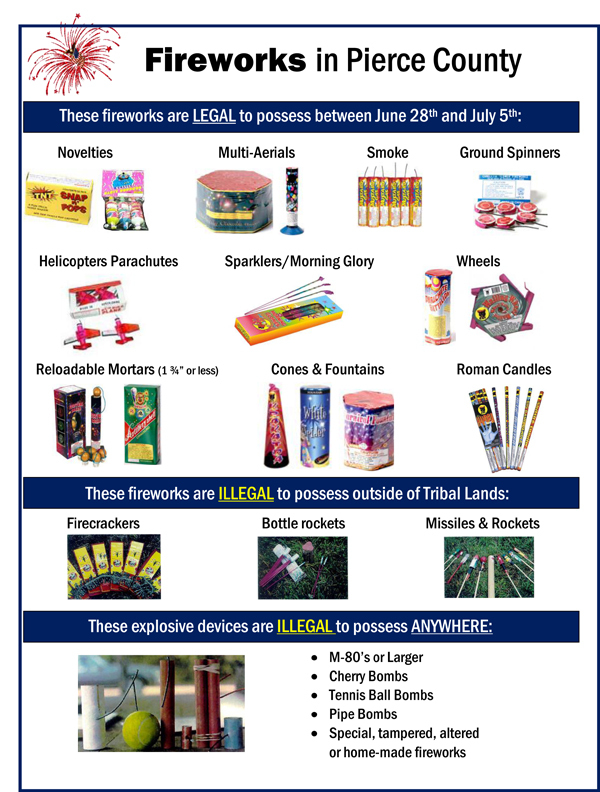 Below are examples of Washington State legal and illegal fireworks. Your jurisdiction's fireworks restrictions may vary. Fireworks restrictions vary by municipality. Click on the following links to view fireworks restrictions in our local communities: City of Bonney Lake, City of Edgewood, City of Milton, City of Sumner, and Unincorporated Pierce County. July 4: 9 a.m. - 11 p.m.
June 28: Noon - 11 p.m.
June 29 - July 3: 9 a.m. - 11 p.m.
July 5: 9 a.m. - 11 p.m.
July 1 - July 3: 10 a.m. - 11 p.m.
July 5: 10 a.m. - 11 p.m.
View a complete list of discharge restrictions and bans in Washington State, and Pierce County. Enforcement of illegal fireworks in Pierce County is performed by the Pierce County Sheriff’s Office. Enforcement of illegal fireworks within the city limits of Bonney Lake, Edgewood, Milton and Sumner is performed by their respective police departments and East Pierce Fire & Rescue. Legal fireworks sales are enforced by the Washington State Fire Marshal’s Office.